Happy Father's Day! 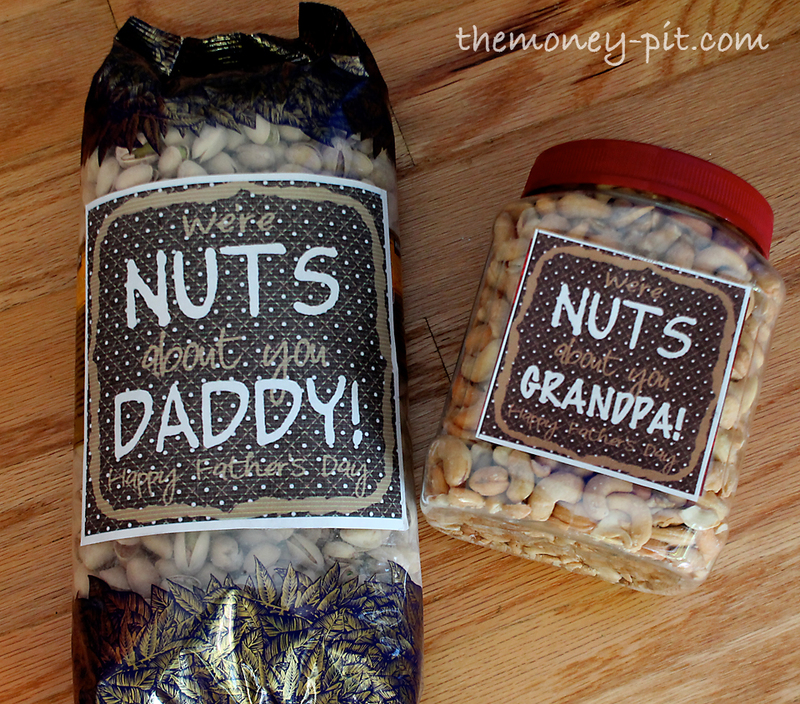 We're nuts about daddy (and linky parties)! You know what I love about linky parties? The fact that there are so many brilliant, creative and smart people out there, crafting up a storm, and (besides Pinterest) there is the easiest way of finding them all in one place. You take all those creative people, and their projects, give us a little thumbnail and short description and let the browsing begin! 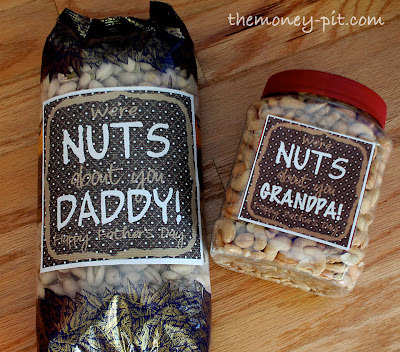 My dad got a giant tub o' Cashews and hubs, who told me his favorite nut is the pistachio got a bag of pistachios. 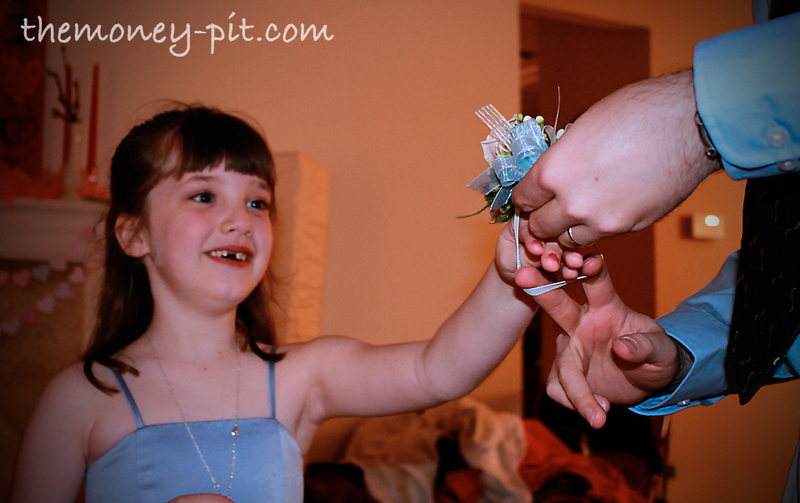 I saw the idea on one the many linky parties I visit each week (I must confess I don't remember which one.) The original blogger (LizzieJaneBaby) had linked it up. She even provided the free printables! I immediately pinned it (from the ORIGINAL SOURCE of course!) so I wouldn't forget where I saw it. Once I bought the nuts, I resized the printables (and I did have to modify one of them since I wanted "Grandpa" and she only had Daddy and Papa) and recreated her awesome idea. And that is the beauty of linky parties.. Not only did I get to share my latest project, I also found a new project I adored and wanted to copy, I found the original source of that project and was able to share it on my blog and on Pinterest where it has been repinned a couple dozen times. I have actually stumbled upon another blogger who also copied this idea after she found it on Pinterest (I have got to wonder if it was my pin?!) What a small world! Isn't it a great system?! 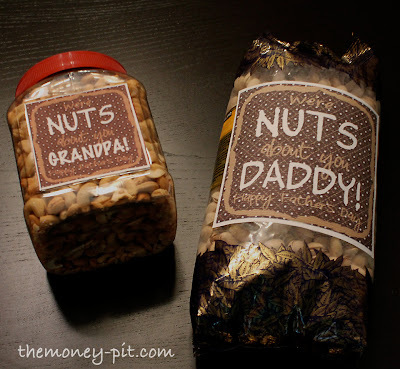 Anyhow.. now that I am done swooning over linky parties, I want to wish you all a Happy Father's Day! The girls are really looking forward to spending the day with Daddy.. the first love of their lives! That's a cute idea! I honestly can never think of anything for my dad! I will definitely be using this sometime! I'm so happy you were able to use this idea!! It turned out really cute! I almost bought that big bag of pistachios or the big bag of peanuts in the shells, but the guys in my life just love cashews. I think the label looks great on the big bag! Thanks for sharing with me. What great gifts :-) ... been enjoying your site so I'm nominating you for the Illuminating Blogger Award for informative, illuminating blog content. I know not everyone participates in blog awards but I hope you'll at least check it out because it's a great way to discover new blogs and meet new web friends. If you're interested in participating, you can check out the details at my site ... http://foodstoriesblog.com/illuminating-blogger-award/ ... Either way, hope you're having a great day!